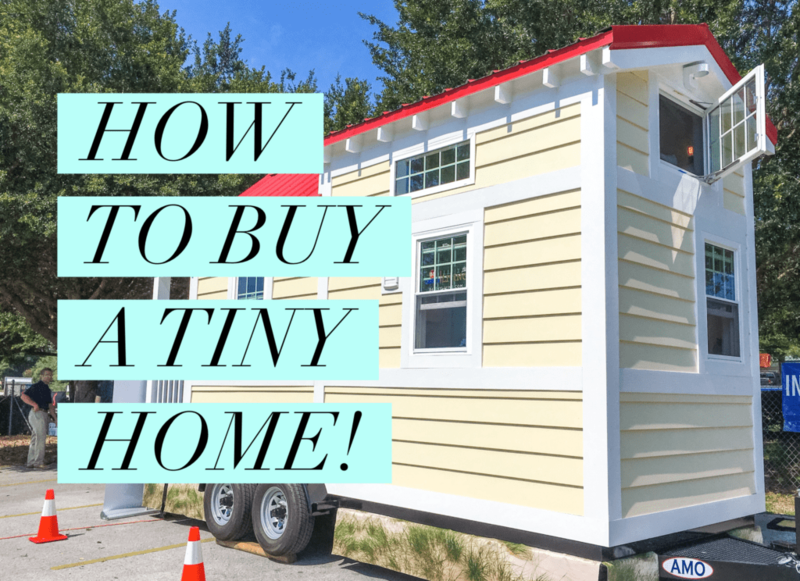 Where can you easily buy a tiny home? You might be surprised! Go to your nearest 84 Lumber, America’s only large building materials supplier that sells tiny homes, and you can buy a tiny home in the checkout line. This post was originally published in June 2016. It has been updated with current information. Want to see a tiny home in person? You can do that too (in a few places….. more on that later on). 84 Lumber is the nation’s leading privately held building materials and services supplier. There are more than 250 stores in 30 states. They just introduced their Tiny Living collection, a choice of four tiny homes. Currently available in four, customizable models, the Tiny Living by 84 Lumber line ranges in size from 150 square feet to 210 square feet. There is no need to find a custom tiny home builder, or wonder who builds tiny homes near you. Simply go to your nearest 84 Lumber and start the process quickly and easily. While I think minimalism is overrated, if you’re considering downsizing, taking a tour of these tiny homes can really put things into perspective of how much space you’d have (or not have). 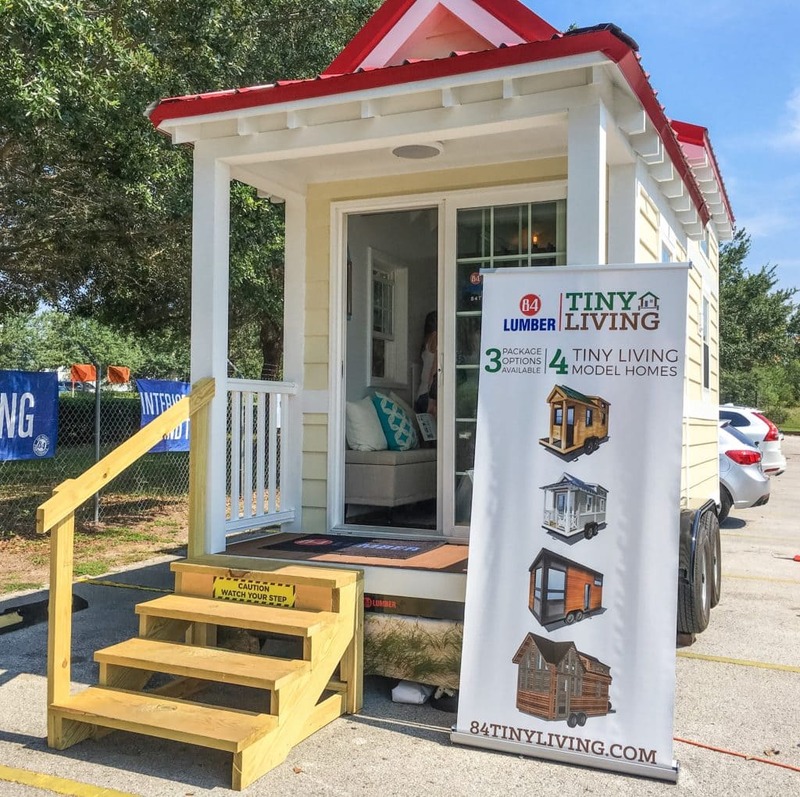 To debut their four custom tiny homes, available pre-built or just buying the plans, 84 Lumber launched a Tiny Home Tour across America in 2016. 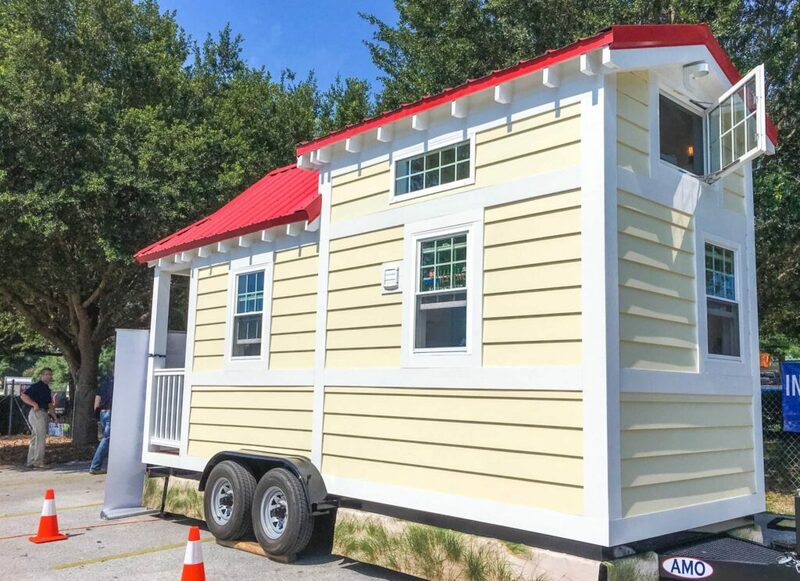 I was fortunate enough to be able to see one of the tiny homes, the Shonsie, at the Tavares, Florida 84 Lumber location. I expected to arrive at the home building store and no one would be there. Even 84 Lumber representatives on the Tiny Home Tour admit they had no idea that this many people would be coming out to see one of their model homes. 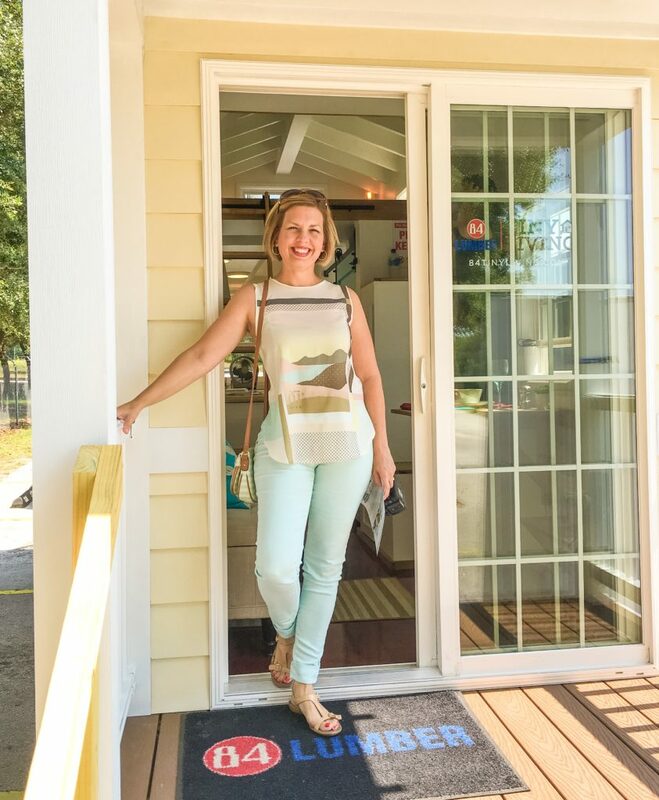 At each stop, hundreds came to get the chance to look inside a tiny home. There were wait times and a line to stand in. They were that busy. Not just with locals, either. Most people that I talked to while waiting in line to see the Shonsie tiny home had driven 45 minutes or an hour and a half just to see this 154 square foot tiny home. What Is A Tiny Home Like? Everyone in line was excited and anxious to see what a tiny home was really like inside. Almost everyone there watched some sort of tiny home building show on TV. 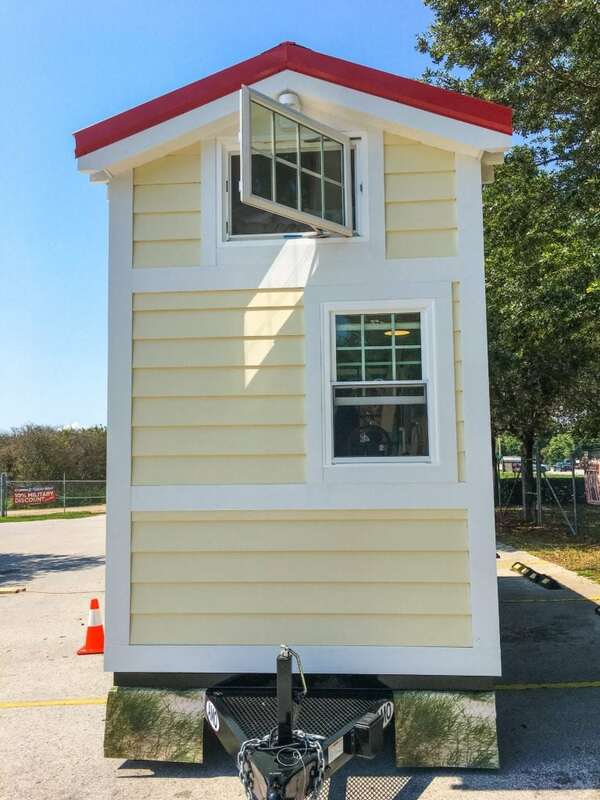 Several visitors were already in the process of downsizing to move into a tiny home. One couple was seriously considering buying. Another lady was doing a bus conversion, but wanted to see what a tiny home was like before she started. The Shonsie was super cute, almost like a beach cottage feel. The colors inside were very beach-glass like, with lots of turquoise. However it is customizable if those colors aren’t for you. There is a blue roofed Shonsie, with a blue floor. We were touring the red roofed Shonsie tiny home, with a red floor. Let me just say, the Shonsie tiny house is tiny! Yes, this tiny home is TINY!!! 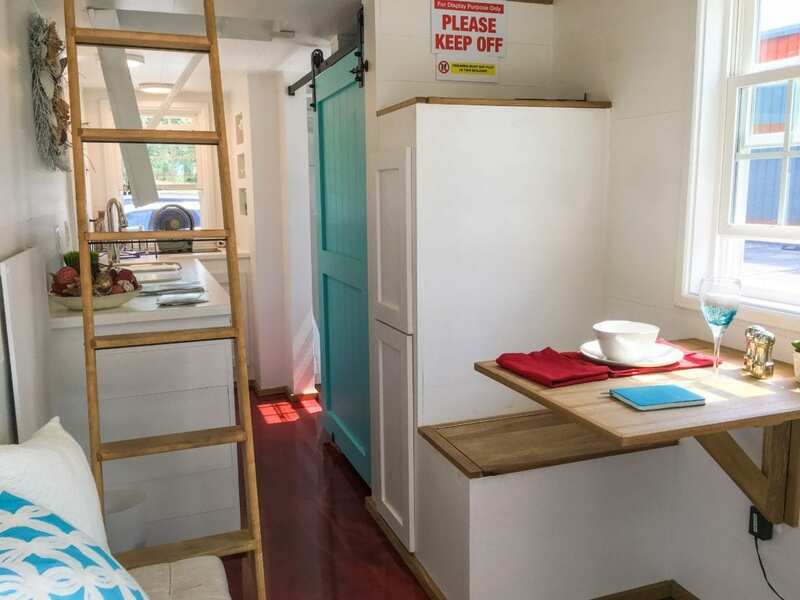 At 154 square feet, it’s among the smallest of the tiny home options at 84 Lumber. There was a quaint dining area, and seating area, but there wasn’t a whole heck of a lot of room to move. Climb up the stairs and you’ll get to the 52-square foot bedroom loft which was awesome. It houses a full size bed, along with extra storage in the loft floor. What the Florida crowd was asking for – and what I think the Pennsylvania based reps were hoping for on that day, too – was air conditioning. As they said, they were more worried with heat in Pennsylvania. In Florida, we’re more worried about air conditioning! And let me tell you, it was hot inside! It is very interesting that 84 Tiny Living has now included air conditioning as standard on all of its models since those first early designs back in 2016. They’ve listened to customer feedback, for sure! 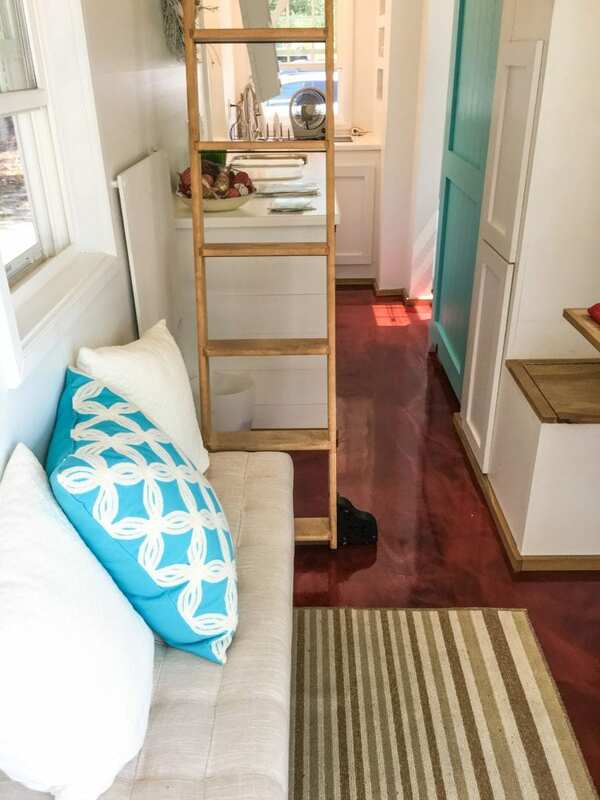 A move-in ready, already-built tiny home such as the Shonsie model starts around $59, 884. That price has remained constant since 2016 through January 2019. Prices of the other 84 Tiny Living Tiny Homes range from around $50,000 – $80,000 fully built. I don’t think I would move into a tiny home this tiny, but it sure was cute! Where to See a Model Tiny Home? Where can you see a 84 Lumber tiny home in person? After the tiny home tour from 84 Lumber, you can see their tiny homes at their Pennsylvania headquarters in Eighty Four, PA. Self-guided tours are available from 7 a.m. to 5 p.m. Monday through Friday. The models will also make appearances at new stores opening soon, according to a spokesperson. How do you finance a tiny home? Lightstream, a division of SunTrust bank, is among the easiest sources. I’ve seen houses like this on TV and think.. there is no way. LoL. But they are cute and such great space saving ideas too. 59,000? Thats insane for this nlkind of home. Im sorry i just wouldn’t ever allow myself to pay that for a tiny home. Nope!